This has got to be one of my favorite snacks. My daughter loves them, too, and requests one nearly every day. It's super easy to eat on the go, and involves only a few ingredients that you likely have hidden in the pantry. The addition of the chocolate chips takes these right into dessert territory. Keep these vegan by using dairy-free chocolate chips. I like the Enjoy Life brand that's sold at Dill Pickle. The bulk bins have many of the other ingredients. These freeze well so consider doubling the recipe. Trust me, they won't go to waste! Pulse oats in food processor or blender until a flour-like consistency is achieved. Add in dates and almond meal, and then pulse again until well combined. Add in the rest of the ingredients except for the chocolate chips. Add those in last and pulse just once or twice to mix. Roll into 12 balls. Store in refrigerator or freezer to keep fresh. As a mom of three, I'm always looking for creative ways to sneak more fruits, veggies and whole grains into my family's diet. These muffins fit the bill and were a big hit with adults and kids alike. 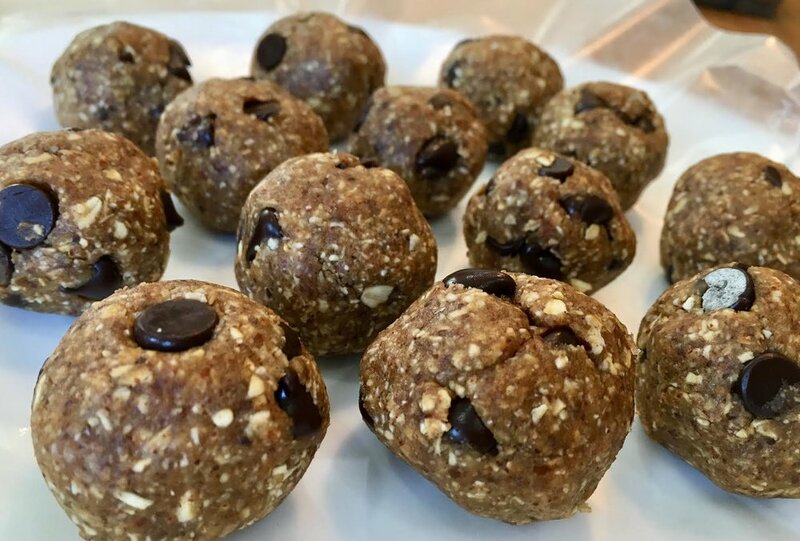 They're packed full of fiber and protein, thanks to the bran, whole wheat flour, hemp seeds and eggs. And they're easily made vegan by subbing in flaxseed or chia eggs for chicken eggs. I like to grab my dried fruits, nuts and grains from Dill Pickle's bulk bins, a budget friendly option. And you can certainly find the other ingredients there, too! Preheat oven to 400 degrees (Fahrenheit) and lightly oil or grease 12 muffin cups. Alternatively, line with paper baking cups. Whisk together first six ingredients in large bowl. Stir in cherries. In a separate bowl, thoroughly combine almond milk, applesauce, oil, molasses and eggs (or flax/chia eggs). Stir wet ingredients into dry just until combined. Do NOT overmix! Top with some oats and coarse sugar, if desired. Spoon into muffin cups and bake for 18 to 20 minutes.